The largest exhibition in Textile Museum history, Unraveling Identity unites textiles from across cultures to explore expressions of individual, cultural, political, and social identity throughout the ages. 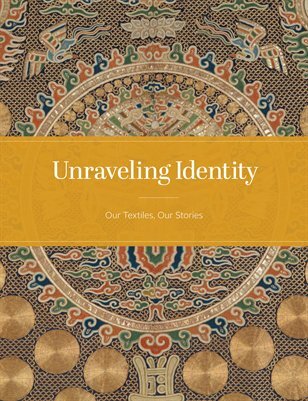 Throughout time and around the world, clothing, adornments, and other fabrics have articulated self and status—from ethnicity and occupation to religious belief. This publication explores some of the exhibition's themes and pieces on display through essays by museum curators Sumru Belger Krody and Lee Talbot, Research Associate for Southeast Asian textiles Mattiebelle Gittinger, and GW Associate Professor of Political Science and International Affairs Ingrid Creppell.